Succot can be celebrated in many ways! 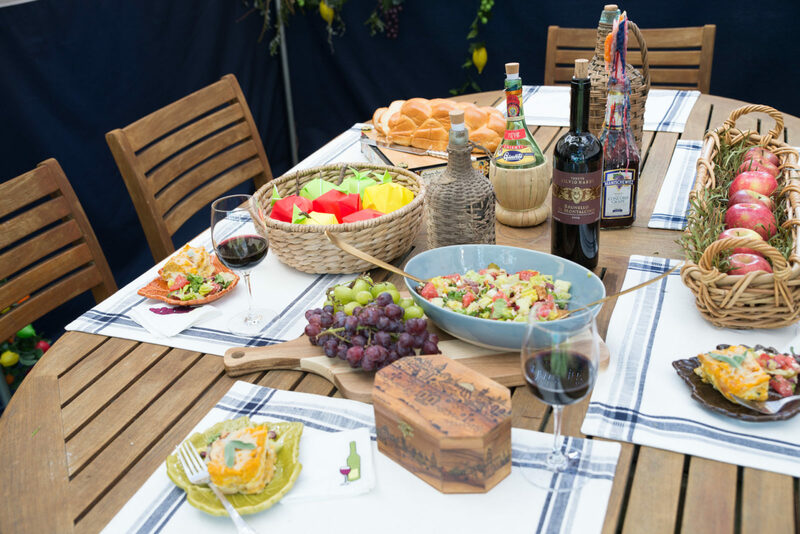 Whether Ashkenazi, Sephardic, traditional, bohemian, or modern, flavors and styles from around the world can be incorporated to create your own Sensational Succah! Be creative! Make it Fun and Festive! Watch our video below to see all 3 of our Sensational Succahs. Succah is Hebrew for “booths” or “huts.” The Biblical holiday Succot is celebrated 5 days following Yom Kippur. For a seven-day period it has been a custom to “temporarily dwell” in a Succah to remember the Israelites who lived in these temporary dwellings during their 40 years of wandering in the wilderness after their Exodus from Slavery in Egypt. A traditional succah is created outside synagogues and homes as a place to invite family and friends to celebrate the fall harvest. 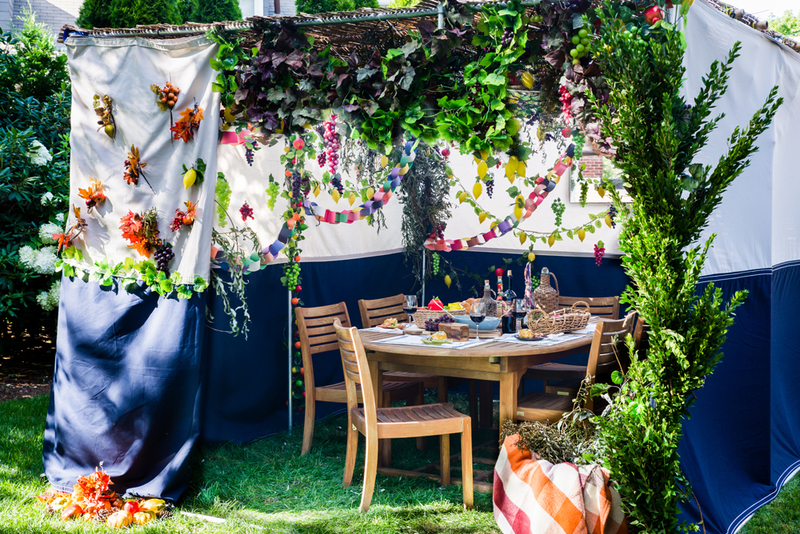 A dining table is set up in our traditional succah to enjoy the harvest with food and comfortable seating for eating, entertaining and sometimes (as in our Moroccan Succah) even sleeping! A tradition is to include four species of plants that are bound together and waved north, south, east, west up and down, symbolic that god is all around us. These species include lulav (palm), hadas (myrtle), aravah (willow) and etrog (fruit from the citron tree). It is common to decorate the succah with fruits and plants of the harvest. It is important to cover the succah roof loosely with s’chach (roof coverings which must have grown from the ground) and pieces of plants from the ground such as palm, bamboo or corn husk and important to only partially cover as to allow the view of the night sky. 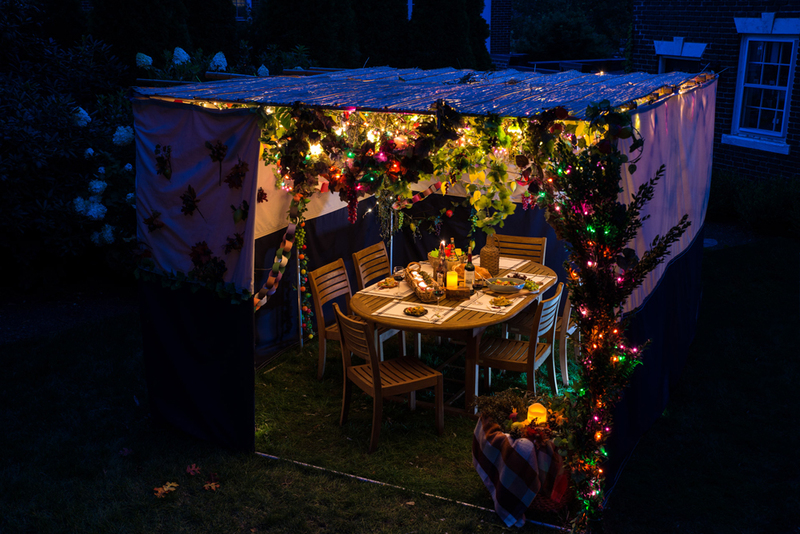 A succah has at least 3 walls, and often can be purchased in easy to assemble kits as we did here at http://www.sukkah.com.